When Does a Google Analytics Session Expire, Really? One of the many ways that Google Analytics and Adobe Analytics differ are their individual definitions of what constitutes a session. Both abide by the industry standard of a session ending after 30 minutes of inactivity*. * Unless you’ve changed the session timeout setting in a Google Analytics property, or the visit definition/visit timeout setting in an Adobe Analytics virtual report suite. I always assumed #1, but I decided to test this out so I’d be 100% sure. In each test scenario below, I opened a new guest browser window so none of my activity from each test would overlap. If all other UTM parameters are the same but utm_medium is different, it will start a new session. The proof: I loaded two URLs with identical values for utm_source, utm_campaign, and utm_id, but different values for utm_medium. When I pull up the report by one of the other parameters, it shows two sessions, validating that a new session was started when I loaded that second page. If all other UTM parameters are the same but utm_source is different, it will start a new session. The proof: In a new, fresh guest window, I loaded two URLs with identical values for utm_medium, utm_campaign, and utm_id, but different values for utm_source. If all other UTM parameters are the same but utm_campaign is different, it will start a new session. The proof: In a newer, fresher guest window, I loaded two URLs with identical values for utm_medium, utm_source, and utm_id, but different values for utm_campaign. How many sessions? Two sessions! If all other UTM parameters are the same but utm_content is different, it will start a new session. The proof: In the newest, freshest of guest windows, I loaded two URLs with identical values for utm_medium, utm_source, and utm_campaign, but different values for utm_content. If all other UTM parameters are the same but utm_term is different, it will start a new session. The proof: I loaded two URLs (in yet another guest window) with identical values for utm_medium, utm_source, and utm_campaign, but different values for utm_term. If all other UTM parameters are the same but utm_id is different, it will start a new session. The proof: Another test, another guest window. I loaded two URLs with identical values for utm_medium, utm_source, and utm_campaign, but different values for the elusive and not-often-used utm_id. Is it a good idea to run two digital analytics tools in tandem? You can add as many tracking tools as you want, they won’t adversely affect each other. I’ve seen companies that have Adobe Analytics, Google Analytics, Parse.ly, Mixpanel, and Coremetrics installed on the same site concurrently. It might affect page load time, but won’t affect data quality. While you technically can have multiple tools in place, it doesn’t always mean you should. As a consultant I feel like I should have to put a dollar in a jar every time I say, “It depends,” but… it depends. Some of my clients do this, most don’t. There are reasons to do it, and reasons to avoid. A second source of data can be very handy for validation purposes or as a backup in case something catastrophic happens with the other tool. Adobe is strong in some areas where GA is weak, and vice versa. Having both implemented gives you the best of both worlds. Novice analysts will be able to ramp up on GA faster, but seasoned analysts might be frustrated by the limitations of GA and need the more sophisticated functionality of Adobe. Most companies use AdWords, so it’s likely that GA is already in place, anyway. $$$ – Assuming you’re on GA360, then you’re paying for two tools. Double the tools, double the maintenance. New tagging requests will likely need to be implemented separately on each tool. The idea of “one source of truth” can get muddied if you don’t have strong governance in place to choose and enforce which one is your system of record. Analysts could potentially cherrypick data and provide biased analysis. You will inevitably end up down the data discrepancy wormhole when users report that the data from Adobe vs. GA don’t match perfectly . Expect to spend time and resources investigating those issues and/or educating your user base that it is normal and expected for two tools to yield slightly different data and to not freak out about a 2% variance. If the advantages are something that you need and the disadvantages are something you are equipped to deal with, then running two tools in tandem might be a good option for you. If the cons outweigh the pros, save yourself the $$$ and the trouble of implementing and maintaining two tools. Traffic and conversion numbers go up and down every day. When looking at trended data, it can be difficult to know when an increase or decrease is truly significant. Sometimes our stakeholders can unnecessarily panic about a dip, or overly congratulate themselves about a spike. This post shows how to add historical and statistical context to trended data using a simple standard deviation calculation in Excel. There are also tips for how to visualize this data to make the statistical concepts very simple for the report recipients to read and understand. For a given metric, pull historical data as far back as possible. For example, if you’re analyzing weekly homepage visits, pull historical weekly data back at least 53 weeks, but ideally 2-5 years if you have the data to support it. The more historical data you have, the better. Prior Year – Data point from the previous year for the same week. This Year – Data point from this year which is the central point of this report. Attention Required – A formula subtracting two standard deviations below the prior year data point for that week. This will be the bottom threshold for the banded chart. Underperforming / Outperforming / Great – The standard deviation value. We will use this value to make a stacked area chart. Acceptable – Also used for the stacked area chart, but because the acceptable band has one standard deviation above and another standard deviation below the prior year value this value needs to be the standard deviation value multiplied by 2. 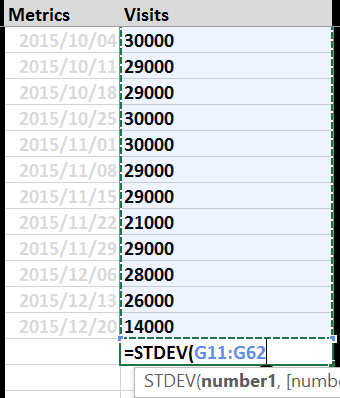 When configuring the chart in Excel, the prior year and current year should be line chart types. In order to create the bands, configure all the standard deviation-related data points as stacked area charts. All the data series should remain on the same primary axis. If a key performance indicator dips into the “Attention Required” zone, that means performance has been very negatively affected and it should be investigated and addressed immediately. In the case of a site or page overhaul or campaign launch, the team should consider rolling back. Does Adobe Analytics Have Its Own Version of Google’s Custom (UTM) URLs for Campaign Tracking? Adobe Analytics has similar functionality, but it works slightly differently. Adobe Analytics has a pre-defined variable called s.campaign which is reserved for campaign tracking. However, the URL parameter that sends data to s.campaign is NOT pre-defined. As is usually the case with Adobe Analytics, it’s customizable and you can choose your own query string parameter. My clients often use “cid” or “cmpid” or “camp,” but you can use whatever you want. Specify the parameter and map it to s.campaign in your tag management tool. In Google Analytics, there are five dimensions related to campaign tracking: utm_source, utm_medium, utm_term, utm_content, utm_campaign. 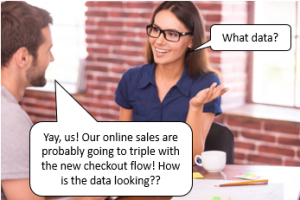 Adobe Analytics was designed to use only one dimension / campaign ID, and then to supplement that unique campaign ID using classifications (formerly known as SAINT). These classifications add supplemental data into Adobe Analytics using that campaign ID as a key, and can be accomplished by either uploading a lookup table, or using Classification Rule Builder to write logical/conditional rules to automatically generate the classifications on the fly. One benefit of Adobe’s method is that it gives you far more campaign-related dimensions. With Google Analytics you get five, but in Adobe Analytics you can have up to 30 classifications. I typically see classifications for Channel (paid search, display, social, email, etc.) and Campaign Name at a minimum. But it’s completely customizable and you can use it for whatever makes sense for your company: the Campaign Manager responsible for a campaign, what day of the week / time of day an email was sent, ad placement size, ad network, etc. 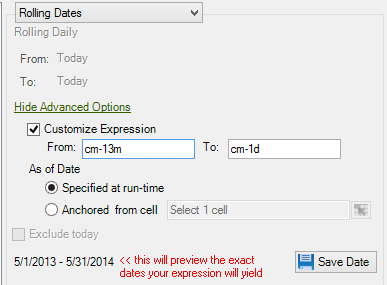 Another benefit of the classification method is that you can retroactively add or modify the supplemental data. If a campaign manager accidentally passed the wrong values to any of the utm campaign tracking parameters in Google Analytics, the data will be incorrect in the reporting. (It would be possible to write some transformation filters to correct it, but it would be a pain and not scalable.) In Adobe Analytics it would be a simple matter of either correcting/re-uploading the lookup table, or correcting the rules in Classification Rule Builder. Using a obfuscated campaign ID – The value in the query string parameter would be some value like “234987423,” and then all the details about that ID would be captured elsewhere, i.e. in a simple spreadsheet, within campaign planning software, or in a tool like Tracking First | Campaign Code Validation. Then the supplemental data would be exported from that other tool and imported into Adobe Analytics. Using a concatenated series of values – The value in the query string parameter would be a delimited, concatenated series of values like “soc:111:555,” where “soc” is a reference to the channel being Social, “111” is Campaign = Memorial Day, and “555” is Partner = Facebook. Using Classification Rule Builder you can parse those three delimited values apart using regex, and dynamically populate “soc,” “111,” and “555” into their respective classifications. So while Adobe Analytics doesn’t work exactly like Google Analytics, it does have similar (and arguably more sophisticated) campaign tracking functionality. The difference is that there is a lot more upfront configuration work to set up Adobe Analytics campaign tracking, whereas Google Analytics campaign tracking is ready to go out of the box. But on the flipside there is a lot more flexibility and ability to customize the data in Adobe Analytics, where you’re just stuck with the default in Google Analytics. And honestly you can extend that observation to any feature that exists in both tools! What are the biggest differences between Adobe SiteCatalyst and Google Analytics Premium? The short answer I always give is that Google Analytics is like a one size fits all t-shirt, and Adobe Analytics is like a custom-tailored suit. The rest of my answer is not so short. The standard reporting interface is usually easier for beginners to learn, but isn’t very flexible when you want to orient the data differently than the default. Same goes for dashboards. With Universal Google Analytics there are a lot more implementation options than there were in Classic Google Analytics, including far more ecommerce tracking options, along with custom dimensions and metrics. With enhanced ecommerce you can now track products from product impression to product view to cart to checkout to purchase, where in Classic GA you can only track products on the order confirmation page. With non-Premium Google Analytics you get 20 custom dimensions and 20 custom metrics. With Premium you get 200 custom dimensions and 200 custom metrics. However, the amount of customization and the degree to which you can configure these custom dimensions and metrics are very limited compared to Adobe. One of Google Analytics Premium’s selling points is you get unsampled data, but to be clear, you do NOT get unsampled data in the browser-based reporting interface. You simply get an option to download the unsampled data into a .csv or .tsv file. With Premium you also get support service, which I believe is Google partnering you up with an official Google Analytics third-party partner. The standard reporting interface has always been super flexible. You’ve always been able to drag whichever metrics you want into a report, breakdown line items by other dimensions, and customize the reporting menu to your company’s needs and internal terminology. And now with their new Analysis Workspace interface that launched on 9/17/2015, it is even MORE flexible. Honestly, Analysis Workspace is the most nimble digital analytics interface I’ve ever seen. You can pivot and segment the data quickly and easily, and the load time is extremely fast.Adobe has other ancillary tools like Report Builder which is an Excel add-in, Ad Hoc (formerly known as Discover) with very powerful segmentation features, and Data Workbench (formerly known as Insight) which allows you to pull in other data sources. The implementation options are really only limited by your imagination and availability of dev resources to put them into place! In regular Adobe Analytics you have 75 eVars and 100 events, and in Adobe Analytics Premium you get 250 eVars and 1,000 events. Each individual eVar can be customized on which value gets credit for conversions (first click / last click / shared) and how long values get credit for conversions (time-based, session-based, or on the completion of some other event). Similarly with events, they can be configured to be incremented, deduplicated per session, or deduplicated across multiple sessions with the use of some unique ID.Not to mention you can easily create calculated metrics in Admin, too. Support is usually directly with Adobe’s account team or Adobe Client Care. The account team seems to be far more focused on selling you other tools in the Marketing Cloud than helping you with the ones you’ve got, and Client Care is usually worthless. On the flip side, I like that Adobe is so customizable and so flexible. This is a blessing and a curse. As others have stated, the quality of Adobe Analytics data is totally dependent on how well it is implemented. Going back to my original analogy, imagine someone who only knows how to sew on a button trying to sew an entire custom-fitted suit from scratch! “If you lead with a story + data, shields come down. The story allows people to drop their intellectual guard. NOTE: Every single presenter must have been given that third piece of advice, because I swear the first 10 minutes of every single presentation at Summit was some useless, often unrelated tangent: ReportBuilder and U2, Discover and river surfing, etc. So while I agree a story can be useful, I would argue the story needs to be RELEVANT. At Summit 2014, there was a session called “Adobe ReportBuilder: Attaining data mashing (Excel)ence“. (Here’s the PDF download of the presentation. It will show more detail than this post.) It was one of the more helpful sessions. If you don’t know what ReportBuilder is, it’s an add-in to Excel that allows you to build data blocks within your spreadsheet that pulls data directly from SiteCatalyst. (It used to be called Excel Client.) It’s a lifesaver for recurring scorecards where you constantly have to pull the same metrics with updated time ranges. No more exporting / copying / pasting! While using cell-based inputs can eliminate the need for this feature, if you happen to still do it the old clunky way there is an option that will save you time by allowing you to mass-edit several report blocks at once. On the “Add-Ins” ribbon in Excel, select “Manage”, highlight the report suites you want to mass edit, select “Edit Multiple”, and follow the wizard to update the report parameters. Don’t forget to refresh! These are useful if you have a report that returns a list of line items that you want to use as a filter in another data block. I didn’t know this was even possible! Using the previous 30 days as a training period, ReportBuilder can estimate the expected, upper, and lower range of data for a given metric. You must be looking at a trended report with daily granularity to be able to use this functionality. Enabling this will help you identify weird outliers in your trended data. Since it took me 2 months to write this post, with the May 22 upgrade it looks like all the events/metrics are now in the same pane and no longer separated by traffic/conversion metrics! No more having to build separate data blocks for visits and revenue, yay!